Do you think someone (you have never meet before) who use Skype™ talk to you maybe he/she lie to you? How do you believe people chatting are true? 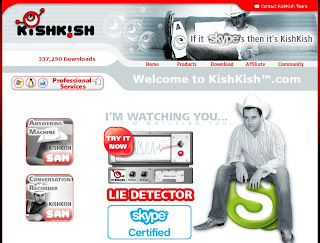 Now, you can use KishKish Lie Detector to detect the stress level of the person you talking with over Skype™. With the use of KishKish Lie Detector you can monitor in real-time the stress level of the person you talked with. This allows you to gage the level of stress and modify your questions in real time. Just download a software on its website, and it will automatic running when you start Skype™ talk to somebody. But I don't think I need it, I just use Skype™ talk to my family.